As in many other cases, this book is probably best read as a short pamphlet or heard in 18 minutes or less TedTalk. It just gets repetitive, preachy, and a bit shallow as it tries to fill the non-fiction quota of pages. Story of Xernona and Craig – She didn’t set out to change his mind, rather change his heart, because, “you’ve got to change a man’s heart before you can change his behavior” (pg 62). “When we enter a conversation, all of our preconceived notions – most of which have no basis in reality – will affect its outcome. No matter how right and true your opinion feels, you consider that it may be a stereotype and not fact” (pg 68). “ . . . assume that everyone is trying to bring about some kind of positive result in their lives (pg 69). “It really didn’t matter if I agreed . . . or not. What mattered is” the acknowledging of pain and allowing for the opportunity to speak about it (pg 79). Conversation Narcissim: The desire to take over a conversation, to do most of the talking, and to turn the focus of the exchange to yourself (pg 105). 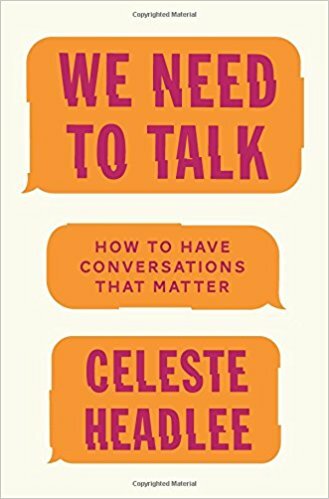 “In time of stress, the best thing we can do for each other is to liste with our ears and our hearts and to be assured that our questions are just as important as our answers” (pg 165).